Nokia Lumia 920 torture series continues, what will break it? It survived the drop test, it survived the knife and hammer test, what about running over it with a car? Maybe setting it up and hitting it like a baseball will do the trick. The Nokia Lumia 920 fared quite well under drop-test conditions, it also made it through the knife and hammer test with no apparent issues what-so-ever. Seeing all that should make you feel pretty good about the build quality of the Lumia 920. It should have no problems dealing with day-to-day encounters. That is not enough for some people though. The Lumia 920’s resilience poses nothing other than a challenge to those that would find its breaking point. What else can you do beyond what has already been done? Quite a bit actually, mostly stuff that is not “real world” viable, but that does not stop the imagination does it? Moving on from mere drop tests and using it as a hammer, we see the poor Lumia 920 go through a battery of tests abusive conditions, from being run over to being used as a baseball, and more at the hands of man. Which one will spell the end of the Lumia? Makes you wonder why Nokia doesn't make bulletproof vests and armored vehicles instead. MORE CRAZY, UNIMAGINABLE STUFF WITH THE PHONE!!!!!!!!!!! HAS IT NOT ALREADY HAD ENOUGH!!!!!!!!!!!! CRAZY WIERDOS!!!!!!!!!!!!!!!!!!!!!!!!!!!!!!!!!!!!!!!!!!!​!!!!!!!!!!!!!!!! Let's try the RPG 7 .. Try one of these tests on Iphone and let's laugh till the next morning. Why are you hurting a lonely wood and a light post??? Insane. I torture my Lumia 900 on a daily basis and there isn't even a scratch on it- really high quality material Nokia is using. i don't want to hold Lumia 920 when i'm angry, it may destroy my house..
wow, pretty impressive, though kinda weird to me. wonder if I should try Lumia 920. So basically this guy just put the Lumia 920 through the Panasonic ToughBook test course. This is a really good phone it would have been great if Meego, Android or maybe even webOS was on board. Don't forget the INDESTRUCTIBLE Nokia 3310!!! 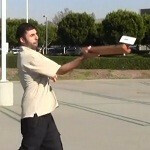 if you see anybody pullling s**t like this, smack him over the head with that wooden stick and send the phone to me! No1 can compete Nokia in build-quality.! Ugh, you Nokia fanboys.. THIS IS NOTHING SPECIAL HTC One x can do just as good, Sony Xperia Active and Go can do BETTER, and Acro S is waterproof. Sure it's a tough handset but don't make another idiotic myth out of it. There's so much more to a build quality than how much beating a phone can take. I want to see Lumia 920 vs iPhone 5 head on collision test.